Spiders are ancient animals with a history going back many millions of years. They have always been with us; an ancient source of fear and fascination. They are abundant and widespread and are natural controllers of insect populations (they eat flies). 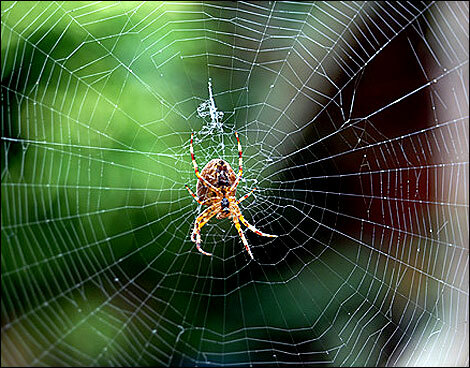 Many different spiders live alongside humans exploiting the nooks and crannies of houses, sheds and gardens. Wherever you live, you're always close to a spider. So, my new flat has spiders. Not a lot, but a few here and there. And I don't kill spiders. They get a pass. Its sort of like how people will eat pigs and cows but cats and dogs are somehow off limits even though they're all the same. Right? "Man's best friend is beautiful and affectionate, an ideal pet. Listen up, I gotta ask you, how can we be so cruel? What kind of meal would he make? We don't want to ask it. Listen up, I gotta ask how can we be so cruel? You say you care, well that's a lie. Full is all you want to feel. that's why cats and dogs have ...ALL THE LUCK !" So I don't kill spiders. And another reason I don't is because killing a spider is bad luck. I don't know where I heard that, but its been in my head since I was a kid. Thou shalt not kill spiders. Thou shalt not put hats on a bed or table. Thou shalt not put shoes on a bed or table. I recently learned those last two actually came from the tradition of dressing a corpse in new clothes and shoes and laying them out so everyone can give their respects in the UK and Scotland. Anyway, let me stop there before I turn this into an entry about superstitions. This entry is about spiders! Spiders are pervasive throughout popular culture, folklore and mythology. The spider symbolises patience for its hunting with web traps, and mischief and malice for its poison and the slow death this causes. Spiders symbolise possessiveness for its spinning its prey into a ball and taking it to its burrow It may also symbolise loneliness, due to the mass spread of arachnophobia (fear of spiders). Though all spiders do not spin gossamer webs, spiders have been attributed by numerous cultures with the origination of basket-weaving, knotwork, weaving, spinning and net making. A famous legend, probably apocryphal, states that King Robert the Bruce of Scotland, when fighting the English, took refuge in a cave after a series of military failures. In the cave he saw a spider, which after repeatedly failing to weave its web, eventually succeeded due to perseverance. The moral of the story being "try, try and try again". Bruce eventually won Scotland's independence. The Italian dance and music tarantella is related to the spider Lycosa taruntela, once thought to be venomous to humans, either as a folk remedy for bites or from its vigorous movements. So, I don't kill the spiders I see in my house. Should I be afraid I'm gonna get bitten ? No. Spiders are unlikely to bite humans because they do not identify humans as prey. However, all spiders will attempt to protect themselves by biting, especially if they are unable to flee from a sitchiation. Spider venom is cytotoxic, which means it causes the tissue at the bite site to die. However, the vast majority of spiders are harmless to humans. Regardless, many people are afraid of spiders (Arachnophobia: fear of bad John Goodman movies). This fear is partly due to myths and to the notoriety of certain kinds of poisonous and harmful spiders like the Black Widow or whatever. But of the 35,000 different species of spiders throughout the world, only about 500 are known to cause painful bites in humans, and only a dozen of these spiders are highly venomous. So, chill. Spiders are your friend! Although spiders are often unpopular, the venom of most species is not very toxic to humans, usually resulting in no more than a slight swelling, inflammation, or itching sensation. Most spiders’ fangs are too small or weak to puncture human skin. Spiders usually will not attempt to bite unless accidentally trapped against the skin or grasped, although some species actively guard their egg sacs or young. Awww baby spiders! Spiders are actually good to have around because they'll eat and kill any other bugs in your house or in your yard and your garden. Which is why spiders are sometimes considered the "clean bug" because they don't hang where its dirty. The camel spider stories began to spread during the 1990-91 Gulf War. Now, with the continued presence of U.S. forces in the Middle East, the stories are becoming legendary. ..Most of the stories on the internet are completely untrue. These creatures are usually not dangerous to humans. But, dangerous or not, these creatures may be horrifying to encounter at first. I too have followed the superstition, mostly, of not killing spiders in my house. It seems intuitively sensible, and works with my semi-Buddhist leanings. However, three weeks ago I was bitten by a black widow spider while a guest at someone's home, where the attic was being cleaned out. I was not in the attic, but it seems a spider was hauled down and somehow got me on the back of the hand. I didn't see or feel it happen. But I had major systemic symptoms (stomach cramps, muscle aches, fever), and the bite site is still funky, like a burn -- the skin blistered and peeled. I let myself get treated by a TCM doc -- no confidence that the ER would even diagnose me properly. So, please don't forget that while most spiders are in fact harmless, they can and will bite. And sometimes that bite is no fun at all. I think is great that you feel this way about spiders and I also think is bad luck to kill them..I found a brown widow, she lived in a box for almost 8 months and then one day she took off, I fed is flies even though the box was open and she could out if she wanted to. her name was Rouge. I miss her! I love cats and dogs too. But in mexico where I live animals have no rights so its kind of a big job for me, I have 8 cats and 3 dogs! I, too, got bit by a mysterious spider, i think in the sand at the beach (got to learn to sit on my towel). the symptoms for excruciating for three nights, the last, last night being the worst without one second of sleep. The symbolism I've looked up has been a stinger as well, the truth hurts. It cleared up some control (emotional entrapment)issues I was subconsciously and unconsciously employing. Winning is not everything. Anyway, on the down-to-earth plane, probiotics made it all better. Took three and the pain automatically subsided. The swelling was spreading to other fingertips but now is back to the bitten tip (the middle finger!) and is localizing there. Sometimes it takes a real wake-up and stay-awake call until we get the message. Cheers!